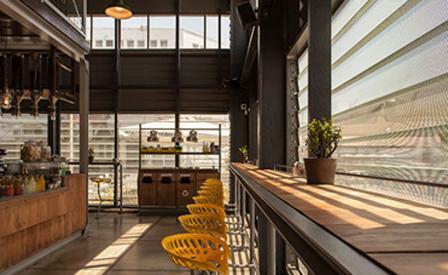 A former Jaffa orange hangar in Tel Aviv has a new tenant: the latest outpost from Tel Aviv’s organic coffee brand Loveat. Designed by Studio Ronen Levin, the café takes up just a corner of the industrial space, enclosed by three glass façades overlooking the charismatic old port. Building on the shipyard theme is the kitchen, camouflaged behind a wall of crates. Custom furnishings were inspired by warehouse equipment and bar stools are repurposed tractor seats from the 1930s. Loveat is celebrated for its ethical stance, using only organic, fair trade coffee and seasonal ingredients in the fresh sandwiches and salads.